There is a certain smug pleasure (that I enjoyed tonight with this wine) in being impressed with a wine that you’ve previously sung the praises of. It’s that ‘hey, I got this very right’ realisation that has you wishing that personal high fives were possible (they’re not, I just tried). What made the first taste of this wine interesting was not strictly the wine itself but the ensuing discussion (and consternation) that flowed from it. Said tasting actually started very normally, with this wine placed in a lineup of other Wirra Wirra reds, including the 2009 RSW Shiraz and 2009 Catapult Shiraz (with the Woodhenge one of the few from the superb 2010 vintage). What caused a kerfuffle (great word that) though was my suggestion that – of all the wines in the bracket – the Woodhenge was my favourite. That it edged out the more lauded RSW (in particular) thanks to an extra vitality of fruit and general shapely restraint, a vitality that I thought was lacking in the slightly heavier, hotter 09’s. In turn, the comment brought lively rebuttal from the table, with Winewise editor Lester Jesburg proclaiming that I was wrong, that the Woodhenge was a fruit bomb and that the others were perfectly ripe and superior. Anyway, back to this wine. 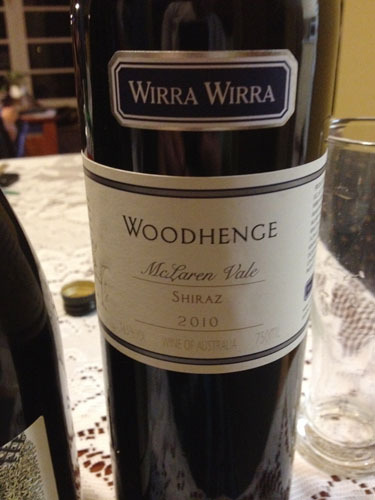 It is, especially when placed in the context of other Wirra Wirra reds, a great McLaren Vale Shiraz. Said context came from the the freakishly good, $100 (when it was released), 2002 Wirra Wirra Chook Block Shiraz which was also opened at Trott’s cup just a few hours after the Woodhenge. Whilst the Chook Block now sits in my mind as one of the finest McLaren Vale Shiraz I’ve ever had, I can happily report that this, a $35 ‘mid priced’ Shiraz, has more than a little of the glories of the Chook Block character in it. That character comes through on the very first whiff too, with dense licorice, chocolate fudge, dark berries and just a little alcohol lift. It’s a very solid, rich and concentrated nose, perhaps a little obvious for some but that obviousness is more just regional character to me. The palate too is utterly Vale derived, with more chocolate fudge-moccha rich fruit and oak, built full bodied, rich and decadent with that lovely tarry/red berried middle that the Vale does so well. Long, even, ripe and powerful, it’s just a little warm to finish though that’s probably not going to bother the real fans. Nice work AG (and JP) in arguing against that sort of rubbish. Good work. Looking forward to trying. PS. The 09 Catapult was a bit too hot and jammy for my tastes. Nice enough mind. Bronze medal quality. Bronze medal quality is about right. 09 RSW solid silver. Yeah, you go boyfriend. Throw him and his ripeness dogma to the curb. Well done – and to Mr Pringle too. Specifically went to rry the RSW but preferred the 2009 Catapault – very very nice, then tried the 2010 Woodhenge and boy what a quality wine for the price. One of the best tasted that day in McLaren Vale.